JACKSON, Tenn. - The Southern League announced during the final week of August that three members of the Jackson Generals, the Double-A affiliate of the Arizona Diamondbacks, were selected to the league's 2018 Postseason All-Star Team. Utility player Kevin Medrano, outfielder Ben DeLuzio, and outfielder Jamie Westbrook each made the team, which is voted on by field managers and club personnel from around the league. 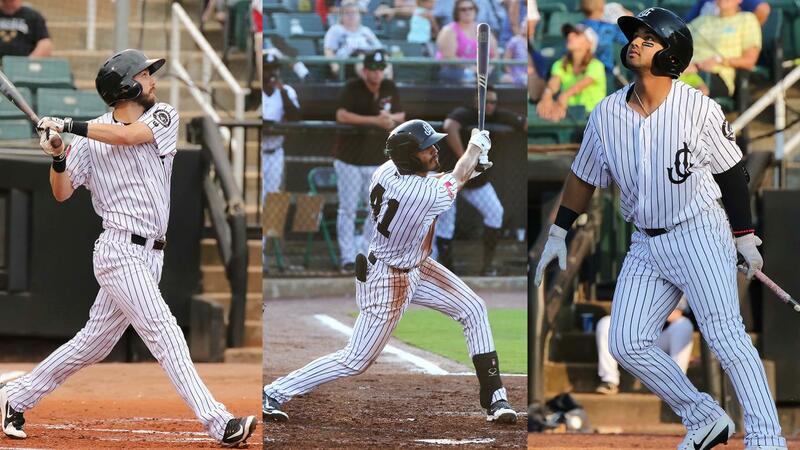 The three selections from the Generals' roster ties for the most selections in the league this year, joining trios from the Biloxi Shuckers and Chattanooga Lookouts. The full release for the Southern League's Postseason All-Star Team is available here. KEVIN MEDRANO, a 28-year-old utility player from Lee's Summit, Mo., adds "Best Utility Player" to his list of 2018 accomplishments, which already include his second Southern League Midseason All-Star game selection and a league-high .333 batting average at the time voting had been completed. Selected by the Diamondbacks in Round 18 of the 2012 Major League Baseball First-Year Player Draft, Medrano is enjoying an outstanding year in 2018, collecting career-best single-season marks in total bases (178), doubles (31), triples (4), home runs (4), RBI (50), slugging percentage (.466), and OPS (.844) across 100 games between Double-A Jackson and Triple-A Reno. Medrano's eye-popping First Half featured numerous top-five offensive totals among Southern Leaguers (.368 BA/.401 OBP/.549 SLG, 75 hits, 24 doubles, 29 extra-base hits), providing a cornerstone on which the Jackson offense averaged 5.17 runs per game before the mid-season break. The five-foot-eleven, 172-pounder also has more defensive positions played in 2018 (six: first base, second base, shortstop, third base, left field, and right field) than errors committed (five), proving an invaluable everyday player for manager Shelley Duncan and defensive coach Javier Colina. Medrano was promoted to Triple-A Reno late in June for the better part of a month, batting .333 (9-for-27) in eight games of action. As the playoffs near, Medrano's .299 batting average in 24 August contests has helped carry the Generals' lineup to a 15-12 record, and he remains in striking distance of Jackson's franchise record for single-season batting average, set in 2009 by outfielder Ezequiel Carrera (.337). BEN DELUZIO, a 24-year-old outfielder from Orlando, Fla., was voted as the Southern League's "Best Hustler" in 2018, his first league-awarded commendation for season-long performance as a professional. Signed by the Diamondbacks in 2016 as an undrafted free agent out of Florida State University, DeLuzio overcame a difficult month of April and 77 days spent on the disabled list to gain the league's respect a table-setter on offense and a hit-robbing center fielder. Returning from the disabled list on the Fourth of July, DeLuzio sparked to life with a three-hit performance that included his first career home run, a two-run shot that tied the game in the bottom of the 12th en-route to a 9-8 Jackson victory. In 24 July games, DeLuzio led the league with a scorching .355 batting average and 15 stolen bases, helping the Generals record their first month with an above-.500 winning percentage since April. DeLuzio continues to wear out Southern League basepaths deep into the summer, swiping 23 bases in 43 Second Half games to bring his year-long total to 32, one behind Southern League MVP Corey Ray with four games to go. On defense, the six-foot-three, 195-pound center fielder has showed off jaw-dropping wall-to-wall wheels, racking up a 2.54 range factor while collecting four outfield assists and making only one error in 161 total chances. JAMIE WESTBROOK, a 23-year-old outfielder from Chandler, Arizona, won Postseason All-Star honors despite his season ending early due to injury. Westbrook has been a metronome at the plate over the last five seasons, consistently playing in at least 100 games while batting .259 or better in 2014, 2015, 2016, 2017 and 2018. The former Basha (Ariz.) HS Bear was drafted by the Diamondbacks in the fifth round of the 2013 MLB First-Year Player Draft, and he won his first Midseason All-Star honor this year by leading the league in the First Half with 76 hits and 133 total bases. Westbrook also ranked in the league's top ten in First Half batting average (.288) and made the top five in games played (67), home runs (11), extra-base hits (30), slugging percentage (.504), runs scored (44), and triples (5) in the First Half. Drafted as an infielder, Westbrook transitioned to a full-time role as the Generals' left fielder this season, and the five-foot-eight, 187-pounder earned his keep by picking up five outfield assists. Westbrook's performance led to his first career call-up to Triple-A Reno, where he batted .391 (9-for-23) over seven games with a double and four home runs. Westbrook finishes 2018 with career-high marks in both RBI (74) and home runs (19) across two levels. Though he has been sidelined since August 12, Westbrook remains the team leader with 65 runs scored through 107 games of action, a number threatened only by fellow Midseason All-Star Rudy Flores (59). Games 1 and 2 of the North Division Series will be held at The Ballpark at Jackson on September 5 and 6.
or log on to our ticket page at JacksonGeneralsBaseball.com! The Jackson Generals, a West Tennessee franchise since 1998, are the Double-A minor league affiliate of Major League Baseball's Arizona Diamondbacks. In 2017, The Ballpark at Jackson was named the Professional Sports Field of the Year by the Tennessee Turfgrass Association.